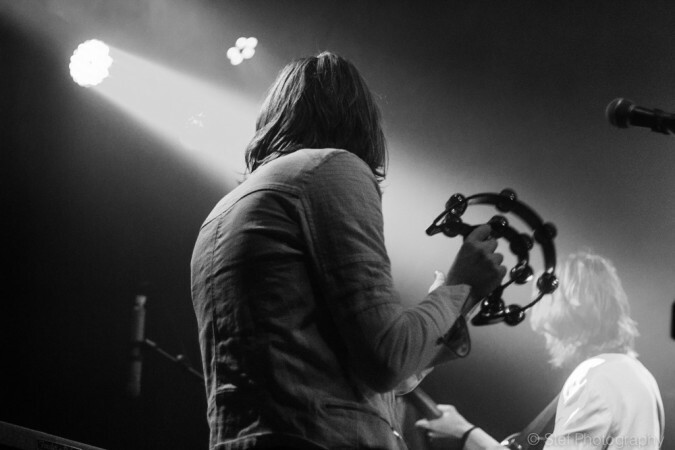 Last visiting Bristol in an impressive support slot for The Charlatans at the O2 Academy in March, Stockport quintet Blossoms boarded the good ship Thekla as bona fide headliners of a UK tour that had already witnessed sell out shows in Glasgow, Leeds, Liverpool, London and Birmingham. Championed on BBC 6 Music and already displaying a promising ear for melody within their hitherto scant offerings of retro inspired guitar pop, it’s a little surprising to see that tonight’s show has fallen short in also achieving sold out status. Arriving onstage, all skinny jeans, white blazers and spangled, slightly Bolan-esque jackets, Blossoms head straight in with the playful, eighties tinged keyboard riff of ‘Cut Me And I’ll Bleed’. Echoes of Jefferson Airplane’s ‘Somebody To Love’ aside, it offers early evidence of the group’s ability to deliver tuneful choruses. Featuring lead singer Tom Ogden’s offbeat guitar stabs and keyboardist Myles Kellock’s psychedelic organ swells, ‘You Pulled A Gun On Me’ is a nod to The Doors while the eighties vibes return with the infectious synths of the title track from the upcoming ‘Charlemagne’ EP; propelled forward by Kellock’s simultaneously playing of two keyboards and punctuated by guitarist Josh Dewhurst’s screeching string bends, it is the arguably the band’s most immediate tune. While Blossoms have sometimes been branded with the “psych-revival” moniker of bands such as Goat, Hookworms and Temples, their strict focus on melody seems to offer a lighter spin on psychedelia. While songs like ‘Smoke’, with its retro keyboards and spiralling, reverbed guitar riffs, contain all the psychedelic hallmarks, the group is unabashed in mixing it up with ultra-poppy synth lines, the occasional glam-rock stomp and lovelorn romanticism such as in the acoustic led ‘My Favourite Room’. Even the chorus to 6 Music favourite ‘Blown Rose’ seems to contain the briefest flicker of Lionel Richie’s ‘Hello’. 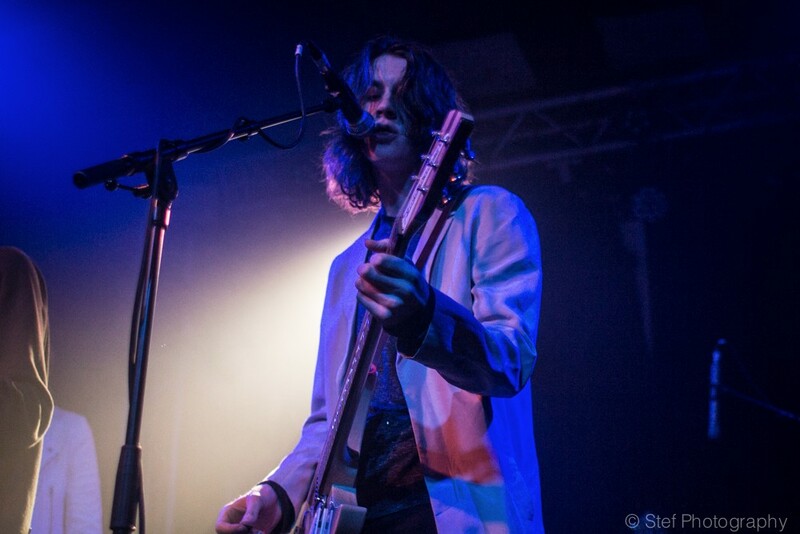 Sporting straight, shoulder length hair, Ogden has the appearance of a stretched Alex Turner circa 2009 and, though his repartee is generally in keeping with the brevity of the nine song set, he portrays enough of a deadpan confidence to suggest that his audience relations are capable of another gear. He knowingly interprets a semi-coherent heckle as “Blue army” (one suspects a reference to Stockport County F.C), faux apologises after mistaking two people at the front for a romantic couple and describes the band being two weeks into recording their debut album as “a big thing”. Formed just a couple of years ago, the youthful five-piece are a tight unit of two guitars, bass, keyboards and drums. Perched towards the back of the stage, the nearly anonymous Kellock is the band’s secret weapon with his rapid keyboard lines and ambidextrous riffing while Dewhurst upholds guitar tradition with regular solos that eventually catch fire during the frenetic assault of final track ‘Blow’. It all makes for a giddy tunefulness upon which Ogden can layer his distinctively northern vocals that oscillate somewhere between Tim Burgess and John Power. A sharp, forty minute performance concludes and a few captious grumbles within the crowd as to the set’s duration can be heard upon departure; it’s difficult to say precisely what they expect from a band yet to deliver their debut album. Whatever the answer, it’s all academic now. Blossoms march on towards another sold out show at the Manchester Ritz tomorrow night. Most certainly one to watch out for in 2016. Tagged blossoms, review, scott hammond, Thekla. Bookmark the permalink.